IWI X95 SAR 5.56 NATO 16.5 FDE. CALL TO ORDER. he X95 is the Special Forces firearm for the 21st century. Like all IWI firearms, it was developed in close cooperation with elite units of the Israel Defense Force, tailored to their specific requirements and needs. 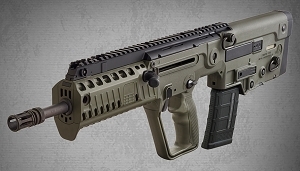 Taking cues from the Tavor TAR-21 issued to the IDF, the X95 continues the evolution of the modern bullpup CQB rifle. Slim and compact with a 16.5" barrel and an OAL of 26", it is offered in 5.56 NATO, easily converted to 9mm Luger Parabellum and soon to .300 AAC. The X95 features STANAG magazine compatibility, forefinger ambidextrous magazine release, interchangeable pistol grip assemblies and a tri-rail forearm with removable rail covers for easily customizable accessory placement (flashlight, laser, vertical fore grip, bipod, etc.). Like its predecessor the TAR-21, the X95 is 100% ambidextrous to right or left hand operation with the optional opposite hand bolt. 100% ambidextrous capable configuration and operation with optional left hand bolt for 5.56 NATO.